Neither age, fitness level nor distance will be an issue riding the most powerful E-bike in the Valley. Our company is aware of the greenhouse effect and is proud to offer zero-emissions electric bicycles. Our E-bikes hold 500 watts/hour in the battery. This energy will allow you to ride the 20 miles with plenty of power to spare. In order for the battery to attain 500W of electricity from a full charge, the electricity generated from coal energy will produce 345 grams of CO2. It will produce 0 grams of CO2 from sun energy (using photovoltaic cells). To cover the same 13 miles route in a very low consumption car (40 miles per gallon), 3600 grams of CO2 will be produced. 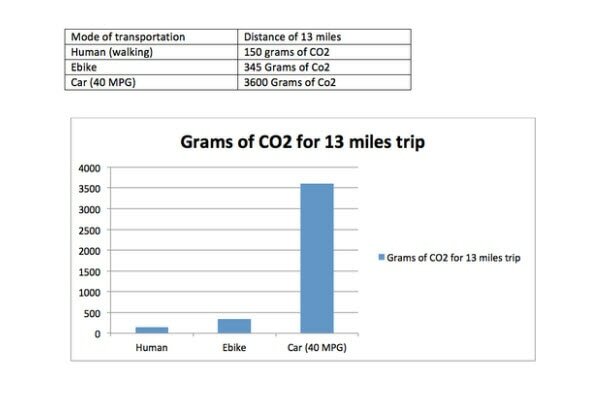 In comparison, a human being will produce about 150 grams of CO2 by walking the 13 miles in approximately 3 hours.